In partnership with our neighbours the contemporary art gallery, Osborne Studio Gallery, we will be oﬀering a ‘painting of the month’ during 2018. Hester was born in Holland and moved to rural France as a professional artist. The gallery was drawn to the power and strength of her animals, about which she is passionate and wants to paint nothing else. 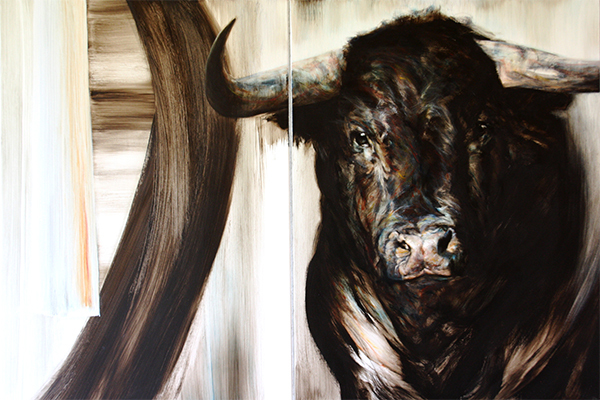 Her work in oils pays tribute to the formidable presence and majesty of horses, bulls and elephants. She succeeds in evoking the inner spirit of these creatures, which makes her paintings so appealing. WHICH ART FOR MY INTERIOR ? please contact anna.rowlinson@osg.uk.com to discuss further or visit www.osg.uk.com.